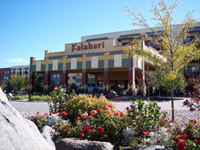 Kalahari Resort and Convention Center - SOLD OUT!! Instructions for booking online can be found by clicking here. Cancelation Policy: 72 hours or more before arrival date full refund minus $40.00 cancellation fee per room. Less than 72 hours before arrival date results in charge of 100% of first night's room rate plus tax. Cancelation Policy: Less than 72 hours before arrival date results in forfeiting one night stay. ** Every registered guest can enjoy a hot breakfast.